A Flawless Face Made Easy! For a glowing, “no-makeup” look, choose an easy-to-wear multi-tasker with SPF. Dampen the Blending Sponge and apply CC Cream by gently bouncing the flat end against skin. It’s the fastest way to get ready for a fabulous weekend! When it’s time to dance the night away, opt for full coverage, long-wear formula. 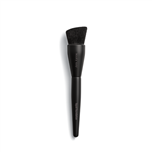 Apply liquid foundation with the Liquid Foundation Brush, using upward, circular strokes to blend from the center of your face outward.